In the latest world of EUlunacy, we have some interesting 'developments' on the Greek crisis front. First up, this: per Irish Finance Minister Noonan, 'Greesolution' agreed Monday am will have 'no budgetary implications' for Ireland, although Ireland 'will be taking on new liabilities'. Translated into Human language this means: no official increase in Government deficit, but new debt will be issued by Ireland to fund Greek bailout. Using ESM key, our share of EUR86 billion bailout will be ca EUR1.41 billion. It might be slightly less or slightly more, depending on a range of factors. Choice 1: support Greek debt write downs. Which would have cost us the same EUR1.41 billion at most, but would have achieved a reduction in Greek debt. Alternatively, if it was structured via monetary financing (ECB-monetised write down) it could have cost us (and rest of EU) virtually nothing (the cost would have been carried out via ECB simply writing down its own assets and liabilities - a balance sheet exercise). Choice 2: current agreement-envisioned new loans for Greece - which will require all euro area states chipping in to fund the bailout and thus will require Ireland borrowing funds in the markets, increasing our debt, and giving them as loans (more debt) to the already over-indebted Greece. 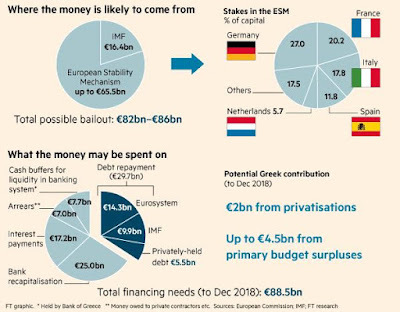 EUR29.7 billion of cash to be loaned to Greece will go to pay down the money borrowed by Greece under the privies EU lending schemes so that a merry-go-round of European policymaking can spin and spin. 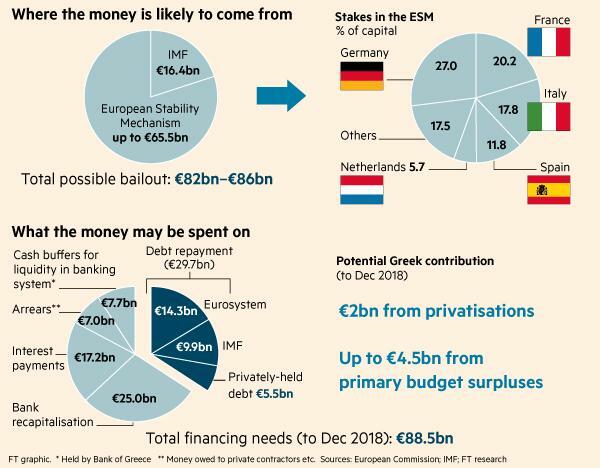 EUR25 billion will go to the banks to cover damages done by previous merry-go-round schemes. EUR17.2 billion will pay interest on past and current merry-go-round schemes. EUR7.7 billion will go to the banks to cover potential runs by depositors scared of the merry-go-round schemes. In total, all but miserly EUR7 billion of new loans to Greece will go one way or the other to sustain unsustainable old loans. My brain aches from European leaders' insistence on staying oblivious to the reality, my heart ache for European people forced to sustain this oblivion.